News articles, letters, documents, videos and publicity materials, donated by Steve Antler, documenting the process and acquisition of Big River estuary from Campbell Hawthorne Timber Management Company in 1999 and the creation of Big River State Park in 2000. For a more detailed description, search for Big River Conservation in our online collection. Photographs, administrative papers, employments records and ledgers pertaining to the operations of the Caspar Lumber Company (1861 to 1956) and the company town of Caspar some of which is still in existence. Search for Caspar Lumber Company in our online collection. Organizational papers, letters and news clippings documenting the movement to create the Mendocino Headlands State Park from 1968 –1972, led by Emmy Lou Packard and others. Search for Mendocino Headlands State Park in our online collection. Architectural drawings, photos, maps and correspondence relating to the construction and maintenance of Point Cabrillo Light Station, from the records of the Point Cabrillo Lightkeepers Association (PCLK). Search for PCLK in our online collection. Articles of Incorporation, letters, posters, flyers and news clippings on the efforts of Byrd Baker and others to stop the killing of whales off the Mendocino Coast from 1974-1977. Search for Mendocino Whale War in our online collection. This collection includes transcripts of LAFCO hearings, boundary maps, feasibility studies, general information and a scrapbook of news clippings of the efforts to incorporate Mendocino into a city in 1988. Search for Mendocino Incorporation Papers in our online collection. Nannie Escola, together with her son Emery, collected hundreds of handwritten notes and newspaper clippings about ships and logging on the Mendocino Coast. Included are historical photographs of people who worked here, lumber camps and mills, and other related events and commerce. Search for Nannie Escola Collection in our online collection. Glass negatives created by Mendocino photographer Perley Maxwell in the early 1900’s, as well as approximately 250 other historical photographs taken on the Mendocino Coast. 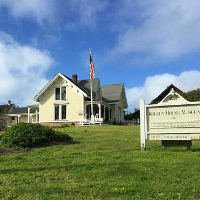 There are charming scenes of early Mendocino life, social occasions and the people who lived here. Maxwell also photographed ships, rivers and the Point Cabrillo Light station. Search for Perley Maxwell in our online collection. The Leonard Cirino Poetry Collection donated to the Kelley House Museum by Ava Hayes, represents a nearly complete collection of poetry by Albion resident, Leonard Cirino, 1943 – 2012. Cirino lived on the Mendocino Coast from the late 1970s until the late 1990s. He was the author of 20 chapbooks and sixteen full-lengths collections of poetry. While in residence, he established Pygmy Forest Press, which published his own work and that of his contemporaries. Search for Leonard Cirino in our online collection. Created in 1890 for William Heeser, the Sanborn Map Collection lays out the commercial,industrial and residential sections of Mendocino. The maps were designed by surveyor D.A. Sanborn to assist fire insurance agents in determining the degree of hazard associated with each particular property. Search for Sanborn Fire in our online collection. From 1916 to 1994, Hollywood studios filmed 58 films (17 silent and 41 sound) on the Mendocino Coast. Local resident and author Bruce Levene donated his collection of movie posters, from The Island of the Blue Dolphins to Pontiac Moon. Twenty nine movie and television scripts are also included in this collection. Also detailed is the unprecedented community commitment to ultimately end the filming activity here, which resulted in the halt of almost all “on location” production in Mendocino. Search for Mendocino and the Movies in our online collection.